A group of volunteers with The Americus-Sumter Fuller Center for Housing in Georgia made it a “day on” Monday in honor of Martin Luther King, Jr. Volunteers helped the walls come together from 9 a.m. to 5 p.m. on the national holiday. Thaddeus Harris and Chuck Davis, the new homeowners, were among those out working on the home. Davis was born with cerebral palsy and the disease progressed during his adulthood to the point where a wheelchair was necessary. He was selected to partner with the Fuller Center in March and is thrilled to finally be working on his new home. “I’m learning things,” he said. “I’ve never built anything in my life.” Throughout the day he tried his hand at hammering, moving lumber and had a certain gleam in his eye while he ran the power saw. Harris has building experience. He was working in construction when injured in 2001 after being thrown off the back of a truck. “For about nine years I’ve just been existing,” he said. Confined to a wheelchair, he moved in with his parents and survival was often all he accomplished in a day. But he glimpsed hope in October when he heard The Fuller Center was looking for another homeowner for the other side of their handicap-accessible duplex. “Before, I was living for me. These people are making me want to be more like them,” Harris said, pointing to the volunteers hammering plywood that will become the wall he and Davis will share. Davis and Harris met for the first time Monday. They look forward to getting to know each other. Americus’ Tom McFarland is a member of the Americus-Sumter Fuller Center board and he helped organize the build on Monday. He noted the significance of the holiday. “They say: It’s a day on, not a day off,” he said. “This is a way to be on and to make positive change in our community. “We will later hopefully have more volunteers opportunities reflecting the diversity of our community,” he said. The Fuller Center plans to partner with a variety of churches for sponsorship and volunteer projects. The duplex is the first new home project the covenant partner took on. 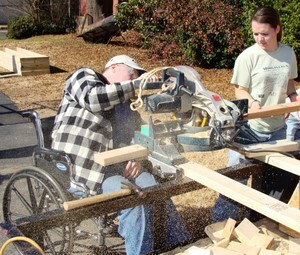 It is partially sponsored by First Presbyterian Church in Americus—whose members take part in the Faith Builders program, which guides churches who want to work on or organize their own Fuller Center projects. Now that the project started moving, organizers don’t plan to stop. If weather permits, the walls will be raised Thursday. And on Feb. 3–the one-year anniversay of Fuller Center Founder Millard Fuller’s death–family, friends, staff and more will head out to put up siding on the home in his honor. Consider signing your church up for the Faith Builders program here.